Identify the doctrine and encourage understanding (discussing): Before Primary, write “Joseph Smith translated the Book of Mormon and restored gospel truths” on a sheet of paper, and cut the paper into puzzle pieces. On the back of each piece, write the name of a person or thing related to the translation of the Book of Mormon (for example, Joseph Smith, Urim and Thummim, angel Moroni, golden plates, power of God, and Oliver Cowdery). Give each class one of the puzzle pieces, and ask them to discuss how the item or person on the back of the piece is related to the translation of the Book of Mormon. Invite each class to come to the front of the room, share what they discussed, and put their puzzle piece on the board. When the puzzle is complete, read the sentence together. Encourage understanding (listening to a guest speaker): Invite a priesthood holder to portray Joseph Smith and tell the story of how he translated the Book of Mormon. Give him several of the pictures the children drew in week 1 and ask him to share how the gospel principles were restored through Joseph Smith. He could wear a simple costume, such as a black ribbon bow tie. Invite him to take off the costume and bear his testimony of Joseph Smith. Encourage application (sharing ideas): Ask the children to stand if they can name a gospel truth that had been lost and was restored through Joseph Smith. Invite a few of the children to share their thoughts. Share your testimony of the restored gospel and the Book of Mormon. Today I am re-sharing one of the very first ideas that I shared on my blog. The original idea was shared in April 2010, HERE, and then I used it again in April 2013, HERE. This is an older idea, but I love it and it goes along perfectly with this week’s topic and it’s super easy to put together. Let’s get started! • Picture of Gold Plates, like this one. Invite your “Joseph Smith” helper to come visit the children again. Have him share how Moroni visited him in his room (Gospel Art Kit picture 404) and share several details from that experience and the day after. Be sure “Joseph” shares where he found the Gold Plates, this will help the children understand the activity that they will be playing for this lesson. Then he could show the children GAK picture 416 and tell them about Translating the Book of Mormon. After Joseph has shared his experience tell the children that they are going to go on a “Search for the Golden Plates”. This is where the rocks, brown paper bags, and questions come in. Before Primary, cut out each rock and attach them to brown paper bags. Inside each bag have a name of a person or item related to the translation of the Book of Mormon (for example, Joseph Smith, Urim and Thummim, Angel Moroni, golden plates, power of God, and Oliver Cowdery). You can type up each name/word or just write it on a piece of paper. If you can find a picture of each item/person you could have that in the bag. Inside the bag with the Gold Plates include the puzzle from the outline or a coded message that the children have to solve. The final message would read: “Joseph Smith Translated the Book of Mormon and Restored Gospel Truths.” If you don’t want to do a coded message, have each word typed onto a strip of paper and then have the children place the strips in the correct order. Now that you have everything together, let’s talk about how to play. Have your stones/brown paper bags hidden around the Primary room. You will want the last stone to be the Gold Plates with the coded message/puzzle, so hide that brown bag extra good, or bring it out at the very end. Invite a child up to the front and have them look “under” one of the rocks. Once they find a rock, have them look inside the bag and reveal what is inside. Have them show the person/item to the Primary and then discuss how each person or item is related to the translation of the Book of Mormon. Continue looking under “rocks” until all the items have been found. 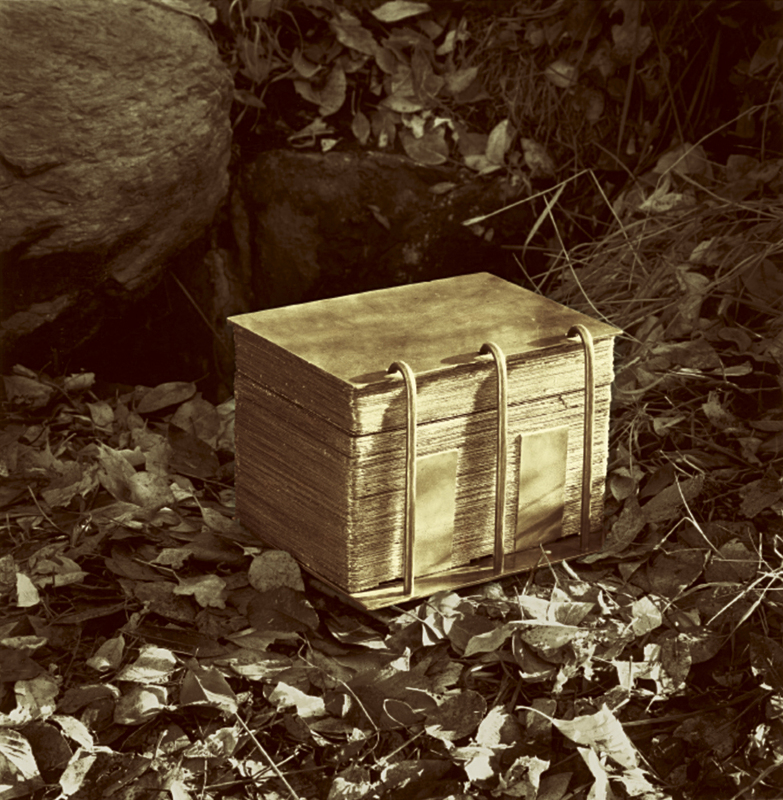 To close, discuss some of the gospel truths that we now have because of Joseph Smith. I have some great rock clipart that you can use to attach to each of your brown paper bags. Just click the link below to print. Click HERE to print my April 2018 Week 4 Sharing Time Idea Printables. I hope you enjoy my April 2018 Week 4 Sharing Time Idea and use it for your lesson. I would love to hear if you do, so leave a comment letting me know. Thank you for sharing your time and talents! I read the lessons and wonder what I can add to make it fitting for our primary then I look here and you’ve already done it! Thank you!! Yay! So glad to hear that you liked the idea. I hope the lesson went well and the children had fun. Thank you!